DSM Dyneema, the inventor and manufacturer of UHMWPE (ultra high molecular weight polyethylene), said to be the world's strongest fibre and branded as Dyneema, has officially opened its new Asia Pacific Technical Centre in Singapore. 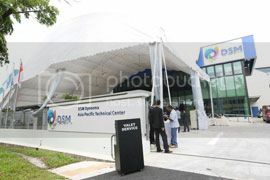 The new 2,500 sq m, SGD$10 million centre located in Tuas, Singapore, is the first for DSM Dyneema in Asia Pacific. In addition to traditional materials testing, the facility will house the country’s first-ever independent ballistics testing facility featuring two ballistic ranges and labs for conducting comprehensive tests for both personal and vehicle armour applications with Dyneema in accordance with international, European and regional Asia Pacific standards. This is the Dutch firm’s third global ballistics testing facility, complementing units in the US and Europe. The facility will support the technological capabilities for customers in sectors such as life protection, shipping, offshore, industrial and safety. In addition, DSM Dyneema will develop and drive new application areas like renewable energy in the region. The Asia Pacific region has seen an increased demand for stronger, lighter and more sustainable solutions, such as the UHMWPE products – fibre, uni-directional fabric and tape, replacing traditional materials like steel and aramids.